Coed Llangwyfan Woodland at Moel Famau / Clwydian Range (NRW)0300 065 30000workForest or WoodlandThis 85 hectare woodland rises very steeply from the the stream at its base and up on to the summit slopes of the Clwydian Hill near Penycloddiau. There are great views along the three walks that start from here, including two to hillforts. Penycloddiau Circular Trail (2.5 miles, 4 kilometres). Coed Llangwyfan Circular Trail (2 miles, 3 kilometres). The Coed Llangwyfan Circular Trail is a walk with a gradual descent through the forest, passing by a range of different habitats and tree species along the way. Moel Arthur Circular Trail (2.5 miles, 4 kilometres). The Moel Arthur Circular Trail takes a steep climb to the summit of Moel Arthur with its prominent 2,500 year old Iron Age hillfort and panoramic views. The return route goes around the foothills. The Offa's Dyke long distance path passes across the top of the woodland and is used by long distance walkers as well as locals on much shorter circular walks. The upper margins border on the Penycloddiau Bronze Age Hill Fort, one of the best preserved in the country. Llangwyfan is the nearest village. From the A525 Denbigh south roundabout, follow the minor road sign posted to Llanddyrnog. Go straight on at the next roundabout across the B5429, turn left at the next junction, follow this road to the top of the hill. 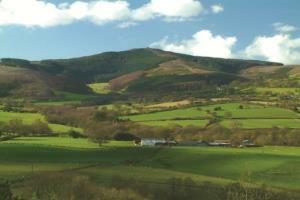 This 85 hectare woodland rises very steeply from the the stream at its base and up on to the summit slopes of the Clwydian Hill near Penycloddiau. There are great views along the three walks that start from here, including two to hillforts.